The revised launch date for the Metop-B satellite from the Baikonur Cosmodrome has been set for 19 September 2012. The launch campaign will resume in early July. Encapsulation of the MSG satellite went ahead as planned on 27 June. This means that the configuration of the launcher is now complete with MSG and its co-passenger, EchoStar, inside the rocket’s faring. EchoStar is in upper position in the fairing and MSG below. With this new milestone complete, the final steps before launch on 5 July will include functional tests, launch rehearsal, readiness review and rollout to the launch pad. Another milestone has been reached in the campaign to prepare MSG-3 for launch: the satellite has been joined to the launch adapter. The MSG-3 satellite was taken off the fuel stand and mated to the launch adapter on Friday 22 June. Since the satellite is now fully fuelled, this a rather hazardous operation. The first step was to unclamped the satellite from the stand that supported it during fuelling. Attached to a crane, the satellite was then lifted slightly and slowly moved across the room to line up with the launch adapter. 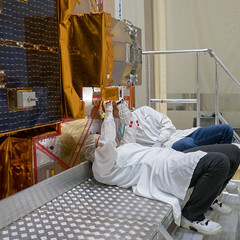 The satellite was then lowered very carefully onto the adapter and then securely clamped. The MSG-3 satellite has now been fully fuelled, marking a major milestone in the launch campaign. Yesterday, the team finished loading 365 kg of liquid fuel (Monomethyl Hydrazine, MMH). This follows the earlier fuelling with liquid oxidizer (Mixed Oxides of Nitrogen, MON). In total, the fuel has increased the mass of MSG-3 by about a ton. MSG-3 will now be installed on the launcher adapter. On Monday, it will be moved to the Final Assembly Building, BAF, for integration on the launcher later next week. The launcher and EchoStar 17 (co-passenger) activities are also proceeding as planned.